Henryk Siemiradzki (1843–1902), Christian Dirce (1897), oil on canvas, 263 x 530 cm, Muzeum Narodowe w Warszawie, Warsaw, Poland. Wikimedia Commons. 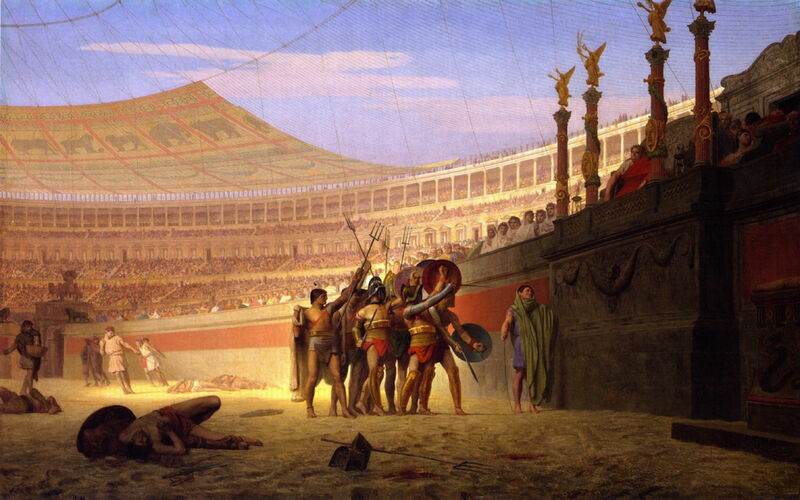 Gérôme’s Ave Caesar, Morituri Te Salutant (1859) was unusual if not radical because of its panoramic view, its depiction of the Colosseum of Rome in reconstruction, and its details of gladiatorial combat in classical times. Yesterday, I considered the first two of those; today I look at the last: paintings of gladiators in combat, and of Christian martyrdom in the Colosseum. 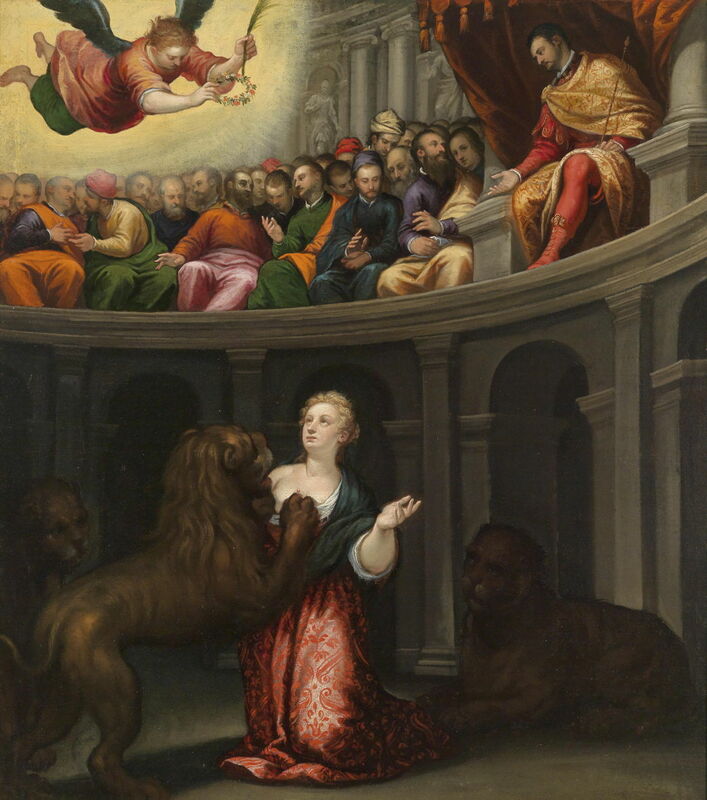 Martyrs and martyrdom were substantial sub-genres in Christian religious painting from earliest times, but generally focussed on the saint and their saintliness rather than the setting of their death. There were exceptions in some crucifixions, and some more grizzly executions such as the disembowelling of Saint Erasmus. Paris Bordone (1500–1570), Gladiator Camp (c 1560), oil on canvas, 218 x 329 cm, Kunsthistorisches Museum, Vienna, Austria. Wikimedia Commons. 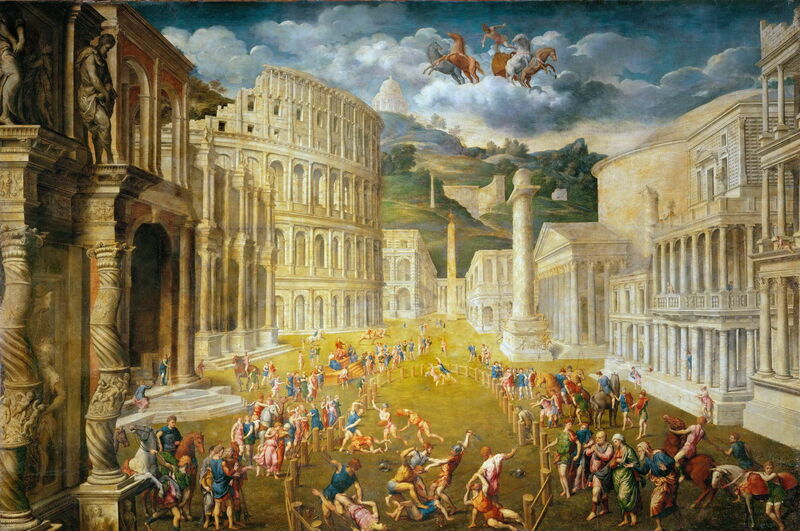 Paris Bordone’s curious Gladiator Camp from about 1560 shows what appears to be gladiatorial training taking place immediately outside the Colosseum. This is one of the few paintings in which other classical buildings have been visually reconstructed, but oddly the Colosseum itself is depicted in a ruinous state. 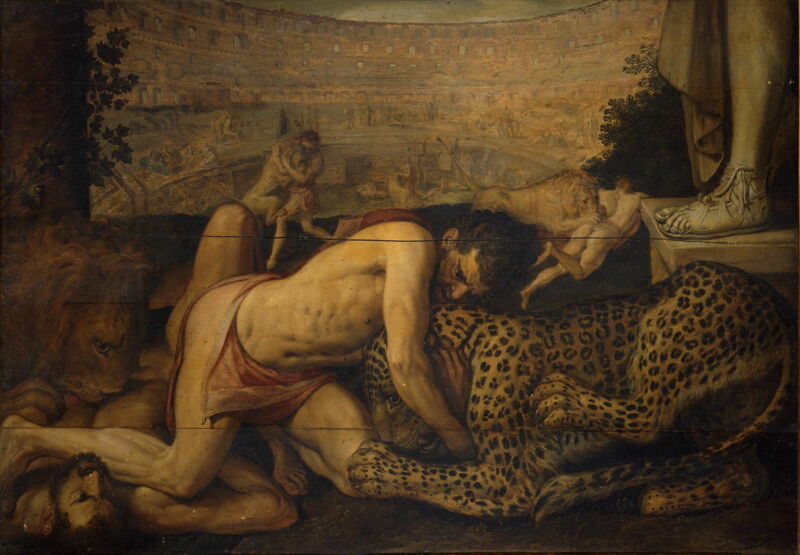 Frans Floris I (1519/1520–1570), Wrestling Beasts in the Coliseum (1563), oil on panel, 130 × 187 cm, Musei Vaticani, Vatican City. Wikimedia Commons. Frans Floris I’s almost contemporary Wrestling Beasts in the Coliseum (1563) attempts to show a more accurate view of the Colosseum in its heyday, although it looks small and still quite derelict. This is, though, one of the few surviving works in which foreground details of a Roman event are shown against a more spectacular setting, and it may have been a painting which Gérôme saw when he lived in Rome. Alessandro Maganza (1556-1630), The Martyrdom of a Saint (date not known), oil on canvas, 105 x 94 cm, location not known. Wikimedia Commons. Alessandro Maganza’s The Martyrdom of a Saint, probably painted around 1600, illustrates one of the characteristics of Renaissance and later approaches to the depiction of such scenes: a disregard for synchrony in detail. The Roman emperor and other spectators are shown in contemporary local dress. This is commonly seen in other religious paintings, such as Nativities. Artemisia Gentileschi (1593–1653), The Martyrdom of St Januarius in the Amphitheatre at Pozzuoli (c 1636-37), oil on canvas, 300 x 200 cm, Cathedral in Pozzuoli, Naples, Italy. Wikimedia Commons. This anachrony is most obvious in Artemisia Gentileschi’s The Martyrdom of St Januarius in the Amphitheatre at Pozzuoli from about 1636-37. 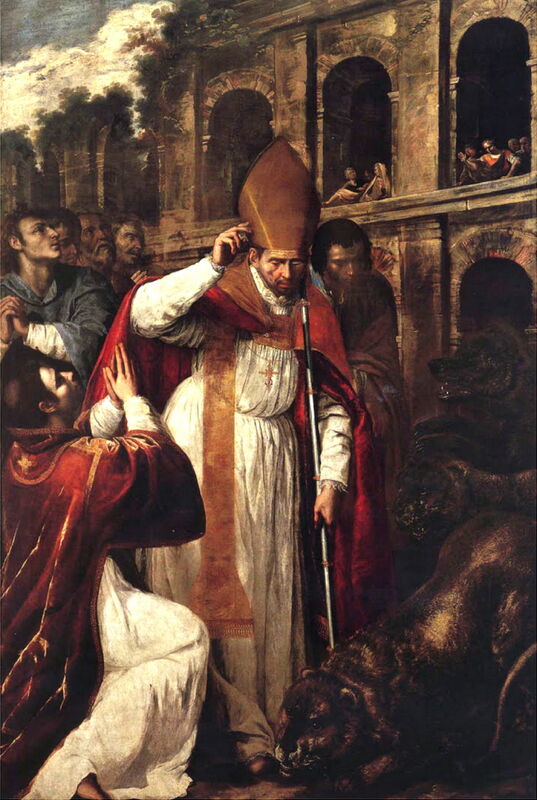 Not only is the saint shown wearing a modern bishop’s dress, but the artist uses an external view of the ruins of the Colosseum in Rome as its backdrop, complete with its vegetation. Giovanni Francesco Romanelli (1610–1662), Roman Gladiators with Wooden Swords (1635-39), oil on canvas, 235 x 356 cm, Museo Nacional del Prado, Madrid, Spain. Wikimedia Commons. Giovanni Francesco Romanelli painted what appears to be gladiatorial training in his Roman Gladiators with Wooden Swords (1635-39), set not in a grand amphitheatre like the Colosseum, but a smaller arena being watched over by three women and some children. Alexey Tarasovich Markov (1802-1878), Eustace Placido in the Colosseum (1836), oil on canvas, 98 x 136.5 cm, The State Tretyakov Gallery Государственная Третьяковская галерея, Moscow, Russia. Wikimedia Commons. The first attempt at a more spectacular reconstructed view seems to have come in 1836, in Alexey Tarasovich Markov’s Eustace Placido in the Colosseum, showing the martyrdom of Saint Eustace, although other traditions claim that he and his family were roasted to death inside a bronze statue of a bull, on the command of the emperor Hadrian in 118 CE. From a pictorial view, though, Markov’s painting is seriously weakened in its impact by its semi-circular shape, which crops out the background. I also think it unlikely that Gérôme saw this work. François-Léon Benouville (1821–1859), Christian Martyrs Enter the Amphitheatre (c 1855), oil on canvas, dimensions not known, Musée d’Orsay, Paris. Image by Rama, via Wikimedia Commons. 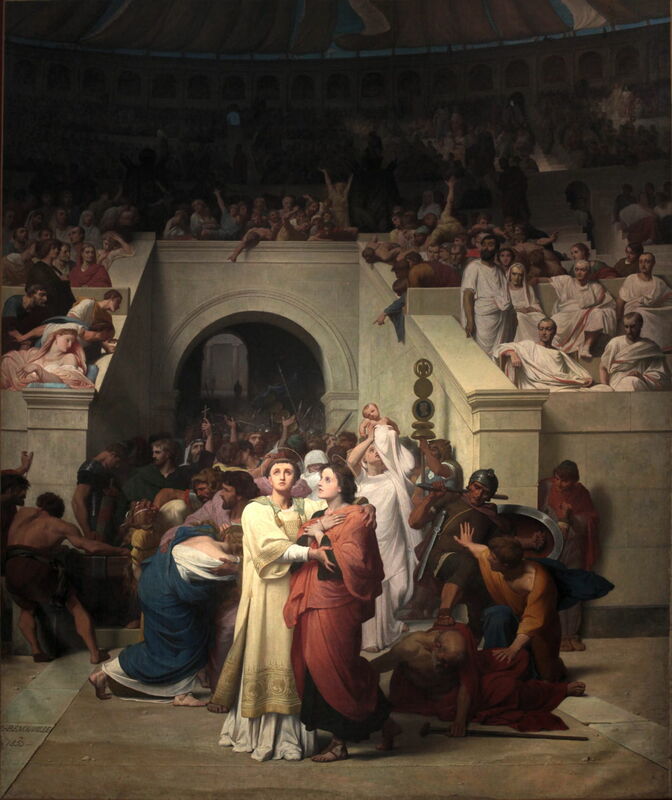 It is more likely, though, that Gérôme saw François-Léon Benouville’s Christian Martyrs Enter the Amphitheatre from 1855. Benouville was a notable painter of religious and Orientalist works, and specialised in depicting the early history of the Christian church. He first exhibited at the Salon in 1838, but died at the age of only 37 before the Salon of 1859. Benouville’s treatment is constrained and avoids the spectacular. His reconstruction of this amphitheatre appears based on the Colosseum, but apart from the front few rows, much of its detail is hidden in the shadows. Fyodor Bronnikov (1827–1902), Dying Gladiator (1856), further details not known. Wikimedia Commons. 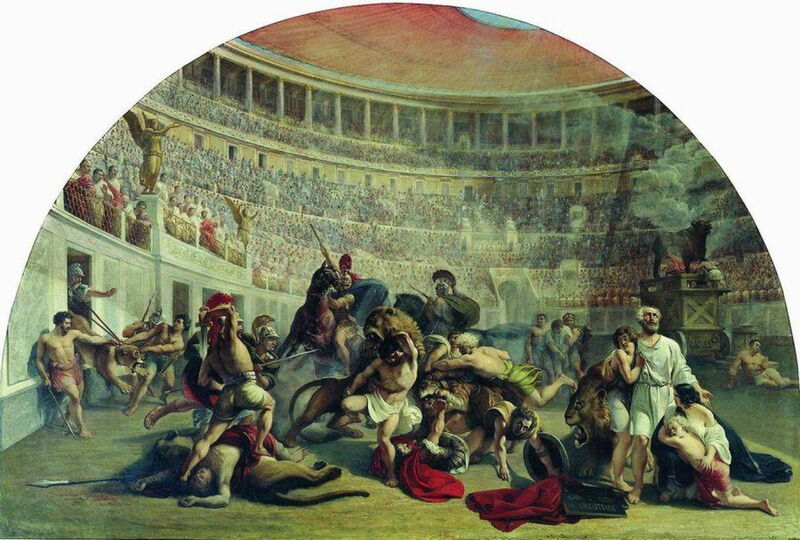 Fyodor Bronnikov painted a couple of views of gladiatorial and other combat taking place in large amphitheatres at about the time that Gérôme was working on his Ave Caesar. 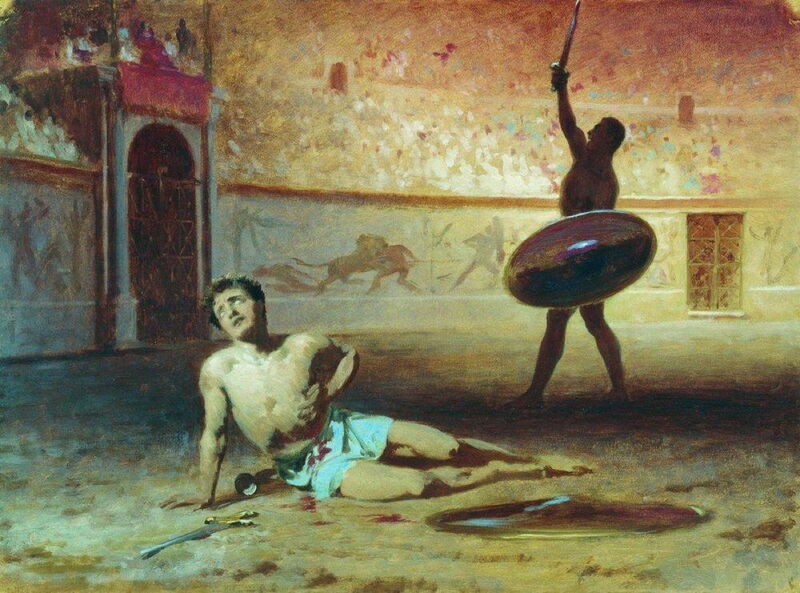 Dying Gladiator (1856) is an example of how close he came to realising the spectacular, but stopped short. In 1859, Gérôme exhibited his spectacular Ave Caesar, Morituri Te Salutant at the Salon in Paris. 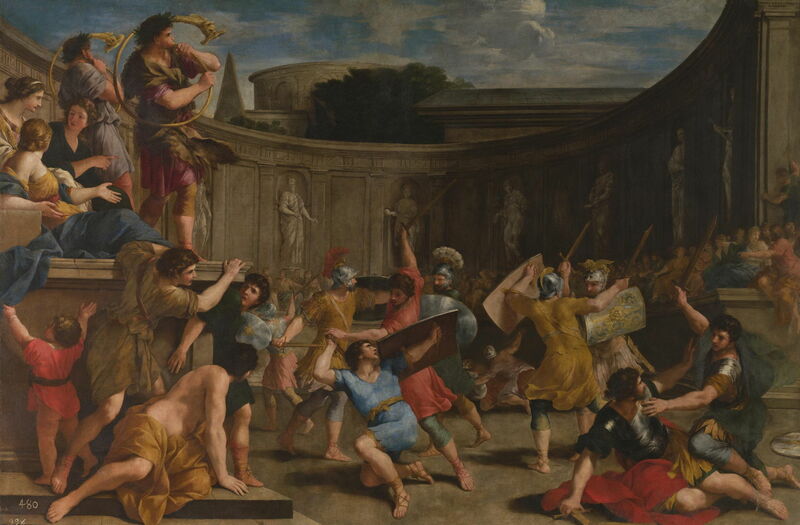 Not only was this the first of a series of his paintings showing grand views of combat and martyrdom in the Colosseum, but it inspired other artists to follow suit. Eugene Thirion (1839-1910), Triumph of Faith – Christian Martyrs in the Time of Nero (after 1863), further details not known. Wikimedia Commons. 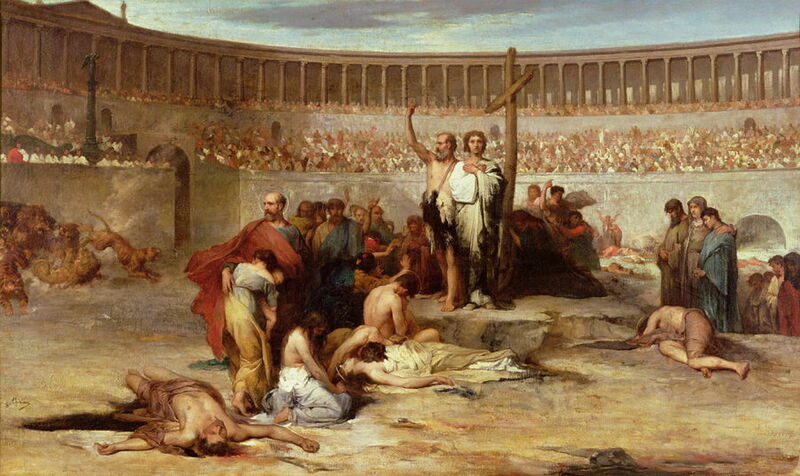 Eugène Thirion’s Triumph of Faith – Christian Martyrs in the Time of Nero is a good example. Thirion trained at the École des Beaux-Arts in Paris from 1860, and studied under Gérôme’s teachers Alexandre Cabanel and Charles Gleyre. As he didn’t exhibit at the Salon until 1863, I think it is safe to say that this painting was made after he had seen Gérôme’s. He also opted to set this in a generic amphitheatre, rather than a reconstructed Colosseum. José Moreno Carbonero (1860–1942), The Gladiators (1882), oil on canvas, 230 x 300 cm, Museo del Prado on loan to Museo de Málaga, Málaga, Spain. Wikimedia Commons. 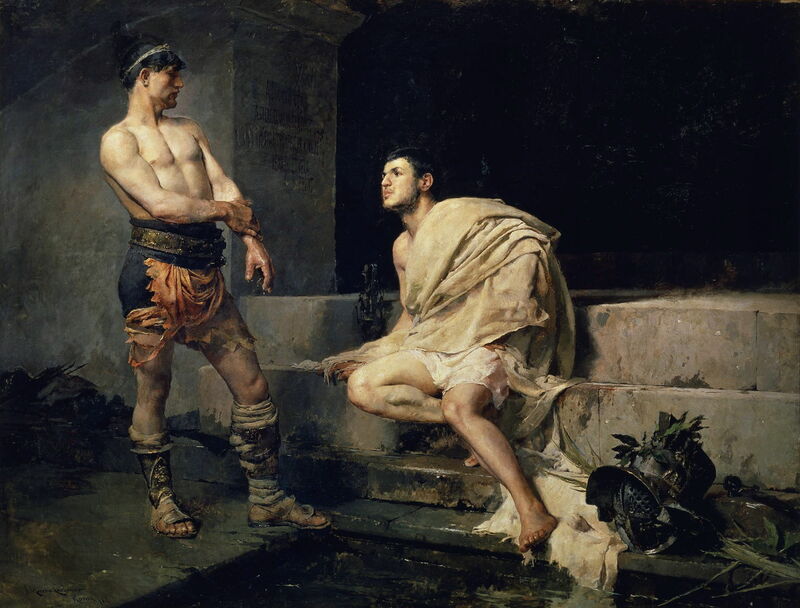 José Moreno Carbonero’s The Gladiators from 1882 is of interest because of its completely different treatment of the theme of gladiators. Its detailed realism suggests a Naturalist style, although it is a very unusual motif for a Naturalist work. My final painting follows in the footsteps of Gérôme, but doesn’t try to be spectacular. Henryk Siemiradzki’s Christian Dirce of 1897 retains attention to fine detail in its realism. Dirce was a figure in Greek mythology who, according to a lost play by Euripides, was killed by being tied to the horns of a bull. Accounts of Roman martyrdoms report that the killing of Christian women sometimes occurred in enactments of the death of Dirce, hence the scene shown here, in which a woman’s near-naked body is draped over the body of a bull. Siemiradzki shows the emperor and his entourage, including two Lictors holding their fasces, symbolic rods and axes, gazing at the grim aftermath. The word Fascism is derived from the fasces, which are themselves often symbolic of Fascist groups. I hope that these paintings have shown how different and visually original Gérôme’s Ave Caesar must have been to its viewers in 1859, even if we are more accustomed to its ingenious visual devices. Posted in General, Life, Painting and tagged Bénouville, Bordone, Bronnikov, Carbonero, Floris, Gérôme, Gentileschi, Maganza, Markov, painting, Romanelli, Siemiradzki, Thirion. Bookmark the permalink. That’s a very controversial book too!